As we know a SiPM consists of a matrix of small-sized sensitive elements called micro-cells (or pixels) all connected in parallel. Each micro-cell is a Geiger-Mode avalanche photo-diode (GM-APD) working beyond the breakdown voltage (Vbd) and it integrates a resistor for passive quenching. 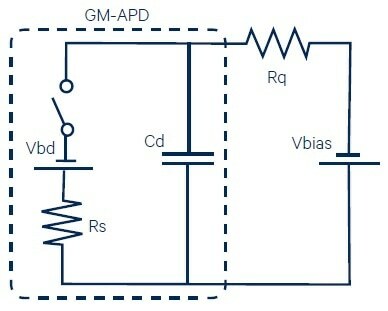 The equivalent circuit of a GM-APD is shown in the image below. Cd is the diode capacitance in reverse bias, Rs is the silicon substrate series resistance, and Rq is the quenching resistor (Rq >> Rs). There are three fundamental operation modes in a GM-APD: quiescent mode, discharge phase, recovery phase. In quiescent mode, the diode is reversed biased to Vbias = Vbd +Vov (Vov is the overvoltage, i.e., the excess bias beyond Vbd). The switch in the equivalent circuit is open and unless a photon is absorbed (or a dark event occurs), the diode remains in this condition with no current flowing (neglecting leakage currents). When a photon is absorbed (or a dark event occurs), the equivalent model prescribes that the switch closes and Cd discharges from Vbias to Vbd through Rs: during this phase, avalanche multiplication is ongoing inside the GM-APD. Once triggered, the avalanche process is self-sustaining meaning that, without quenching, a steady current flows indefinitely in the device. With Rq, the avalanche process is quenched and the switch in the equivalent circuit opens again. 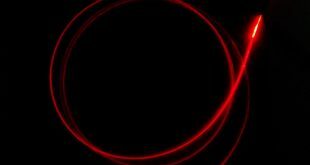 The GM-APD enters now the recovery phase: Cd recharges back to Vbias through Rq and the GM-APD returns in the quiescent mode, ready for the detection of a new photon. In principle, the higher the overvoltage, the higher the SiPM performances. In reality, since the detection efficiency tends to saturate with Vov while the noise keeps on increasing (even more than linearly) with Vov, there exist an upper limit to the optimum SiPM bias voltage. The breakdown voltage is defined by the p/n junction characteristics of the particular SiPM technology. The devices that we used are manufactured by AdvanSiD, and they feature Vbd in the range of 25-29 V at room temperature, and are designed to work in the overvoltage range of 2 to 5 V.
It should also be noted that breakdown voltage depends on temperature, in particular increases as the temperature of the device increases. 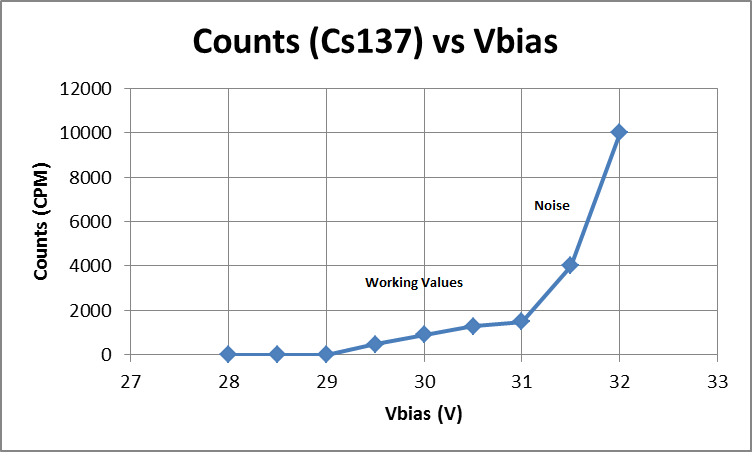 From the above it is evident the importance of the bias voltage Vbias. Since the SiPM gain depends strongly on this parameter it is of fundamental importance to have the possibility to regulate the voltage within the allowed range, also to compensate the variation of the breakdown voltage as the temperature varies. The bias voltage must then have a low ripple (<1 mV) so as not to significantly affect the signal / noise ratio. The project we propose in this post is based on the step-up voltage converter MAX5026, used with its evaluation board (Evaluation Kit). The MAX5026 is a constant-frequency, pulse-width-modulating (PWM), current-mode step-up voltage converter with an internal power switch that operates at 500 kHz. 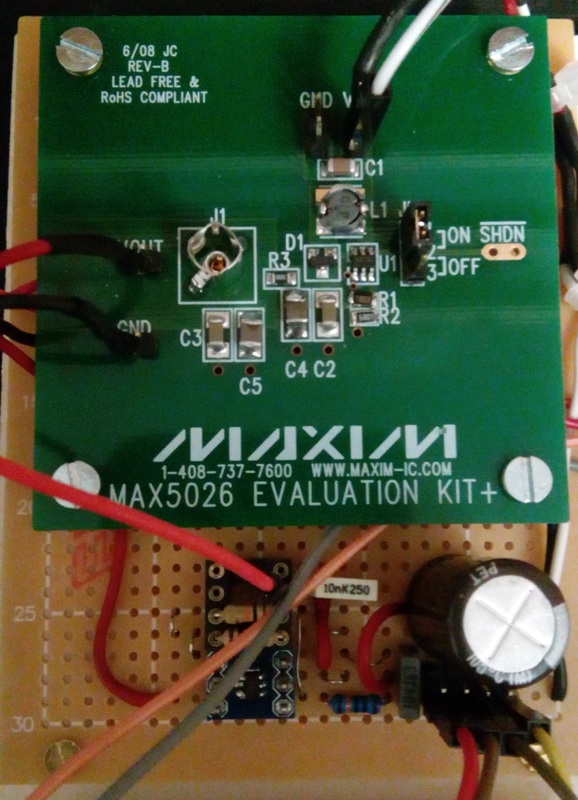 The MAX5026 evaluation kit (EV kit) provides a +30 V output voltage from a +3 V to +11 V input source. It delivers up to 6 mA output current, depending on the input voltage. 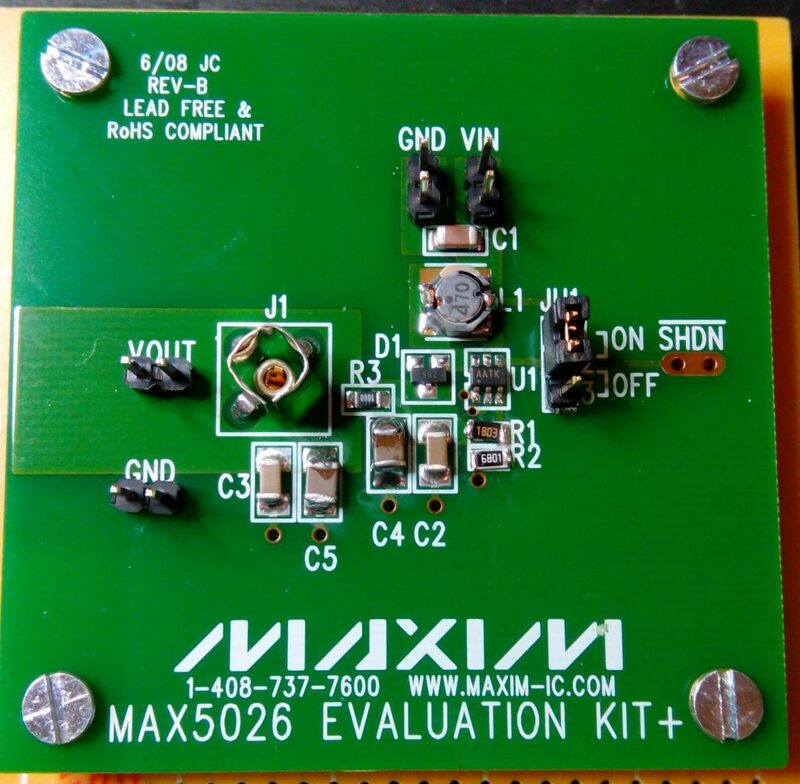 The MAX5026 EV kit is specifically designed for low noise performance. An RC filter at the regulator’s output reduces its noise further. The high-frequency output ripple voltage is less than 1 mVp-p at 2 mA load current. Extra capacitor pads (C4 and C5) are provided for further noise reduction. To reduce low frequency noise, add a 10μF electrolytic capacitor at the pads labeled C4 / C5. We choose R1 = 180 KΩ and R2 = 6.8 KΩ, in order to obtain an output voltage of + 34 V, while the input voltage is +5 V. The output voltage of 34 V allows us to obtain, using a further control circuit, adjustable working voltages between 0 – 34 V. The image below shows the scheme of the evaluation board. To obtain the bias voltage in the required range we used an operational amplifier suitable to be powered at high voltages: the LT6015 component. We fed it at + 34 V and used in the non-inverting amplifier configuration with a gain factor of 10. A stabilized and filtered voltage is sent to the non-inverting terminal in the range 0 – 3.3 V, for example produced by a DAC or by an adjustment trimmer, this voltage is amplified and produces a voltage of 0 – 33 V at the output, therefore suitable to bias a SiPM device. The output voltage is further stabilized by an RC filter which eliminates the low frequency ripple. The image below shows the scheme of the controller. The image below shows the regulator prototype. We did some tests of counting and spectrometry with different values of Vbias. The source consists of a sample source of 0.25μCi of Cs137. The probe consists of a SiPM sensor coupled to a small BGO crystal (the probe has been described in the SiPM with BGO Scintillation Crystal post). 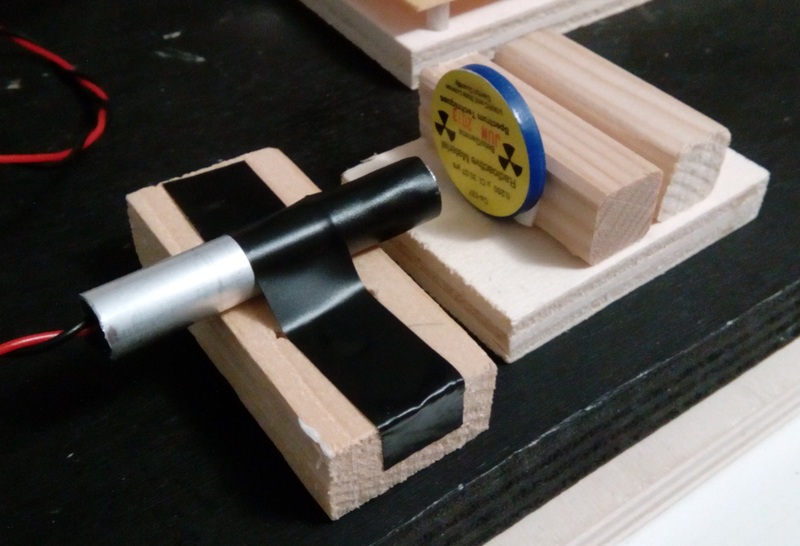 The setup for the measurements is shown in the image below, while the data acquisition part will be described in subsequent posts. We continuously varied the bias voltage Vbias of the SiPM, from 28 V to 32 V, recording the value of the CPM count, keeping the threshold of acceptance of the signal constant at 150 mV (corresponding to 15 mV on the SiPM). The result is described in the graph below. It can be seen how the signal generated by the SiPM becomes measurable starting from 29 V, the count increases up to 31 V, from which the count increases exponentially, a sign that spurious pulses due to noise are acquired. From these tests it is clear that the work area is between 29 V and 31 V.
The optimal value of Vbias is that which allows to maximize the signal to noise ratio obtained from the pulses generated by the SiPM. The signal to noise ratio can be estimated through the peak resolution obtained in the gamma spectrum of the source. The images below show the gamma spectrum of the Cs137 source (acquired by PSoC) for Vbias = 30 V and Vbias = 31 V.
We see how the resolution of the peak at 660 KeV improves slightly from 30 V to 31 V. From these data we can establish that the optimal polarization voltage is between 30 V and 31 V.